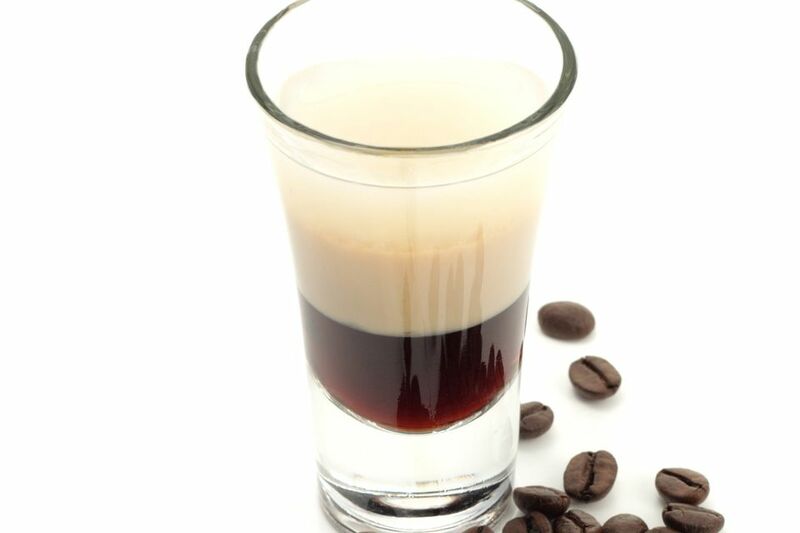 A layered shot is just one way to make the popular Russian Quaalude drink. The Russian qualude is a popular drink that can be made as a layered shot or a tasty highball. There are a few recipes for making it, with vodka as the common ingredient. However you take your Russian qualude, it's a pretty good drink. Fun Fact: This recipe for a Frangelico Russian qualude creates a layered shooter that is a pretty good-tasting mix of equal parts hazelnut liqueur, Irish cream, and vodka. Frangelico is the most popular hazelnut liqueur and Baileys might be your top pick for Irish cream, but there are other options for both liqueurs, so feel free to explore the liquor store shelves. When it comes to the vodka, the choice is yours. However, there really is no need to spend a lot of money on it because this is, after all, a shot and it will go down quickly. Look for a bargain vodka, there are some great ones out there that might surprise you. Pour the hazelnut liqueur into a 1 1/2-ounce shot glass. Float the Irish cream on top of the first layer. Float the vodka on top of the second layer. Chill all of your liquors prior to pouring these shots so the layers are well-defined. A Galliano and Chartreuse Russian qualude is made with two herbal liqueurs and vodka. Galliano has the flavor of vanilla and anise and Chartreuse is much more complex because it is made from 130 different herbs, and the two are surprisingly good complements. To make it, fill a shot glass a third of the way with Galliano L'Autentico. Float an equal amount of Green Chartreuse on top, then a third layer of vodka on top of that. The Russian qualude on the rocks is not meant to be a shot, but a slow sipping drink you can enjoy anytime. It is creamier than the rest and builds on that hazelnut-vodka base. The other difference is that coffee liqueur and milk are added to the mix. Kahlua might be your liqueur of choice here, but there are many other coffee options available. To make it, pour 1 ounce each of vodka, coffee liqueur, Irish cream, and Frangelico over ice in a chilled highball glass. Top with milk or cream and stir well. How Strong Are These Russian Qualude Drinks? You have to remember that layered shots are often very strong because they aren't diluted with ice that turns into water when shaken. This makes the two Russian qualude shooters close to the combined bottling strength of the liqueurs used. However, notice that adding Kahlua to the highball mix makes that a pretty strong drink as well.